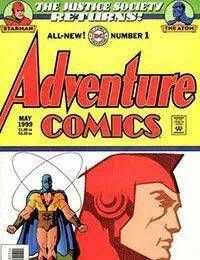 The original Starman and Atom team up to protect Americas crucial Manhattan Project from one of Stalkers Seven. However, this radioactive raider exudes such deadly power that even to approach him is death. Only Starmans cosmic rod allows him to fight Stalkers soldier. But the pugnacious Atom was never one to stay out of a fight, so what sacrifice will he make to ensure that Americas atomic arsenal remains secure?